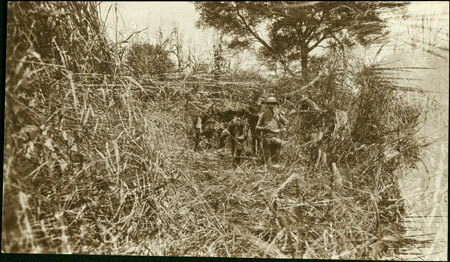 A portrait of Charles Meek (1885-1965) with Sudanese gun carriers and porters, standing amid tall grasses and vegetation during an expedition march. Meek was both an administrator and anthropologist who spent most of his career in Nigeria. Morton, Chris. "Meek on foot during expedition" Southern Sudan Project (in development). 03 Jan. 2006. Pitt Rivers Museum. <http://southernsudan.prm.ox.ac.uk/details/1998.204.11.10/>.